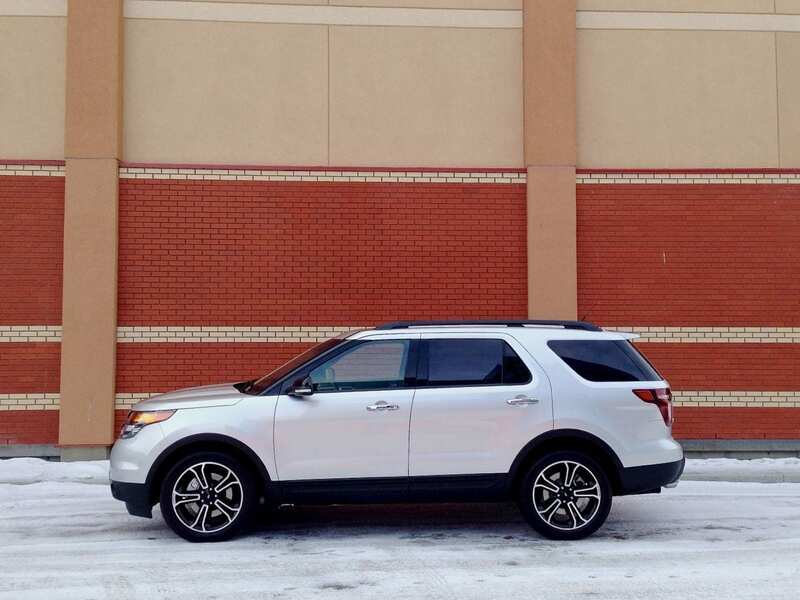 When I heard I was getting an Explorer Sport, I had no idea what it was. 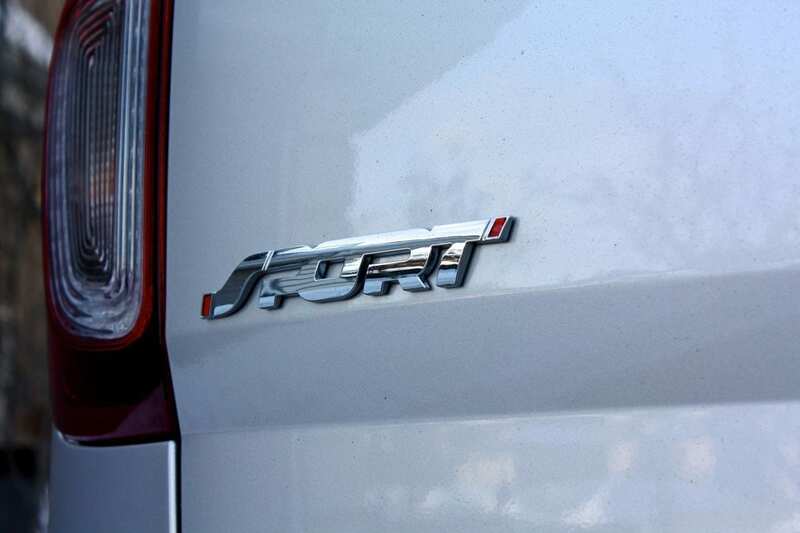 In the last few years, the “Sport” badge has been affixed to the rump of entry-level vehicles by many manufacturers. So I wondered if that was going to be the case. If you couldn’t tell by the pricing, let me clarify – it turns out Ford is heading to the other end of the spectrum with the Explorer Sport. It’s the top-of-the-line, and by Sport, they mean “SHO-engine and stuff”! 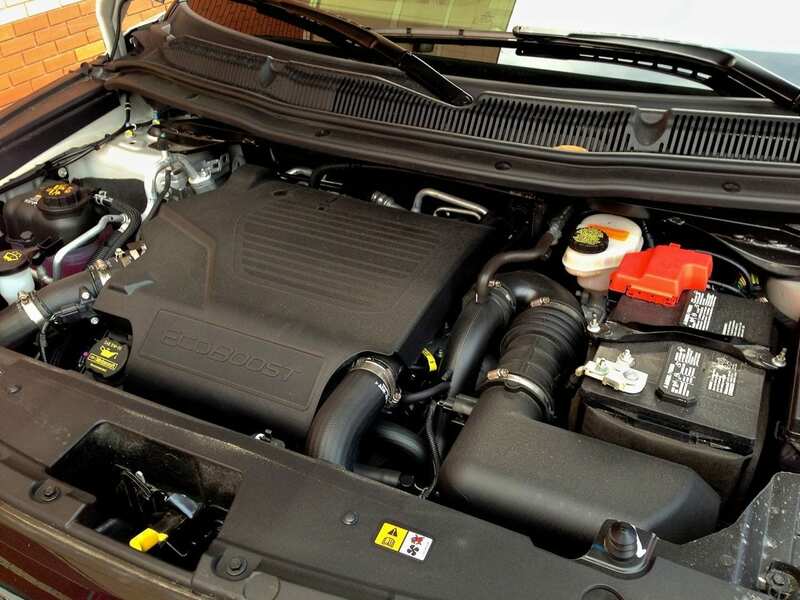 Yep, the Explorer Sport gets endowed with the 3.5-litre twin-turbo V-6 EcoBoost engine. The one that puts out 365 horsepower at 5500 RPM and 350 lb.ft of torque at 3500 RPM. Mmm-hmmm. Ford also tries to set the Sport’s exterior apart and it looks pretty hot. The wheels are snazzy 20-inchers with unique styling. 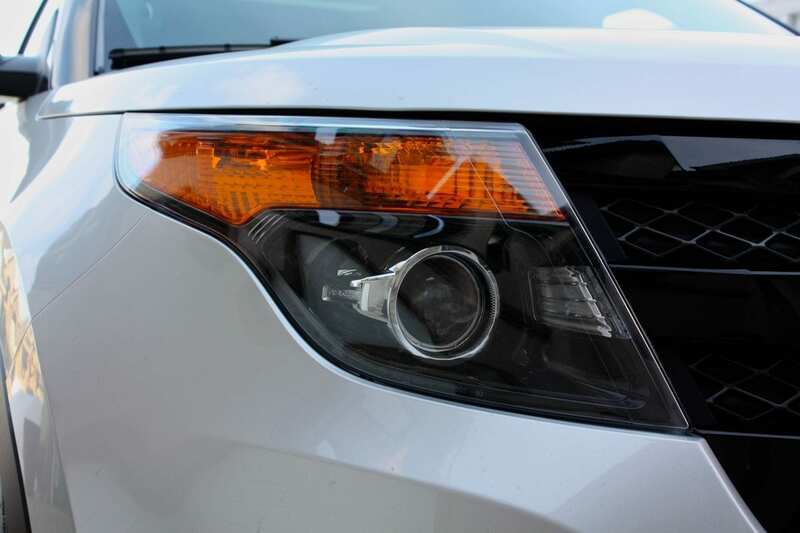 The restyled grille, lower body cladding and tail gate trim are all black, and the headlights and tail lights get a black-out treatment too. 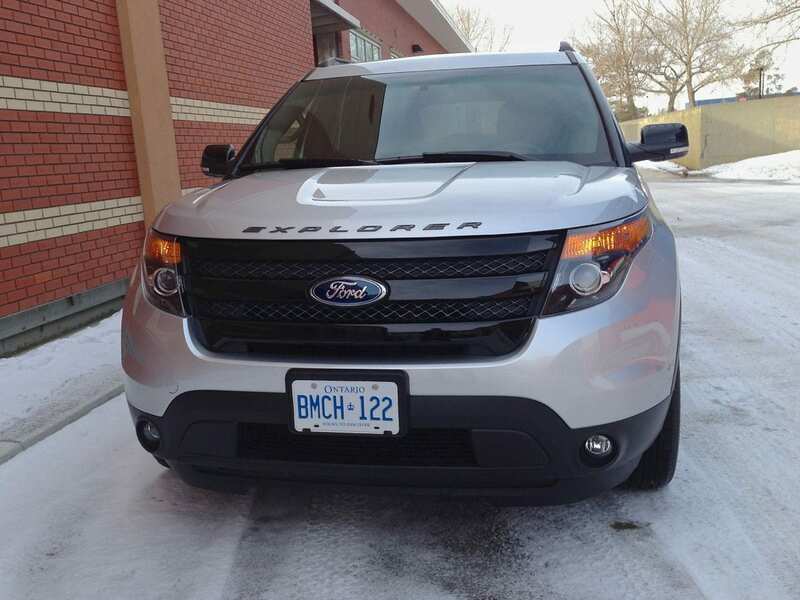 There’s a huge “EXPLORER” badge on the hood. Other than that, it’s all Explorer. 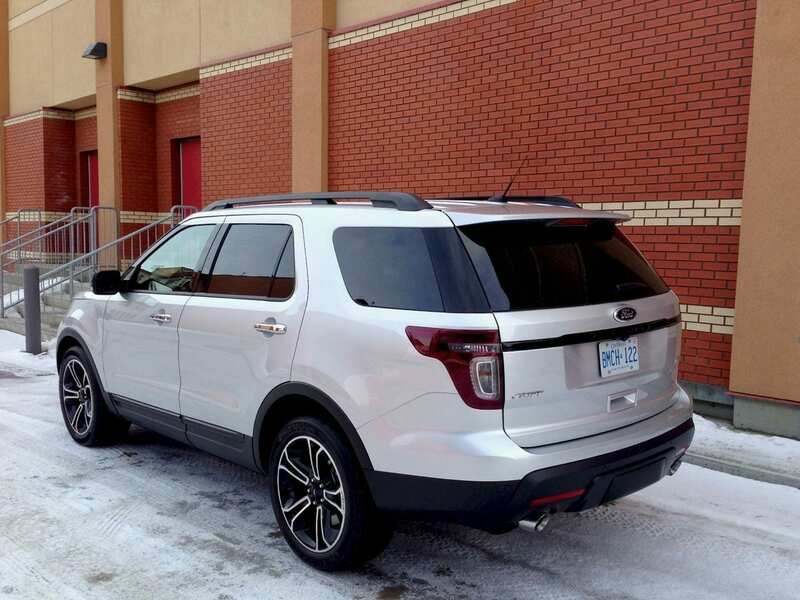 Smooth lines, wrap-around rear window, pretty standard stuff now that we’ve seen this Explorer for a few years. When you step inside (over the high side lip) you’re greeted with a customary Explorer interior. 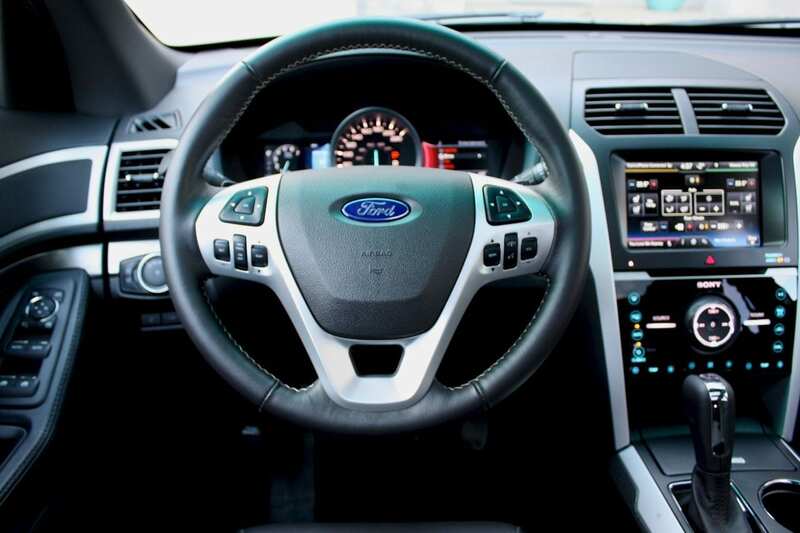 The materials are decent – you’ll find soft-touch plastics almost anywhere your hand falls – the dash, door panels, etc – although I thought the center console was a bit plasticky and cheap. 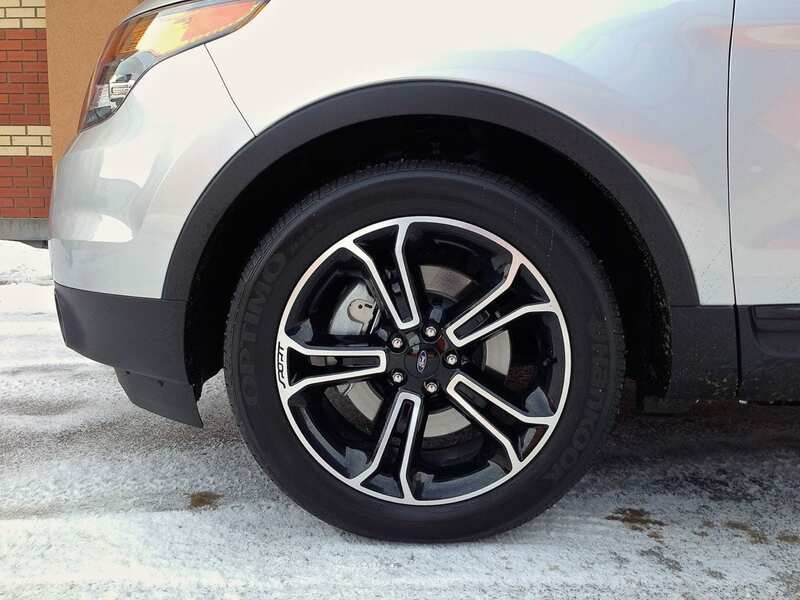 Fit and finish appear to be very good, and the vehicle offered up nary a squeak or rattle, even over our icy, rutted, chock-full-of-potholes Edmonton roads. I found the interior to be quite dark – most everything is black, with the exception of a couple of metallicized plastic trim pieces. The heated, cooled and power-adjustable front seats are trimmed in perforated leather with contrasting stitching, and are “sport-style”. Not sporty enough, in my opinion, as the bolstering could use some help. They are very comfortable though, and nice to look at. The steering wheel is power-adjustable (as are the pedals), and it has controls for media, cruise and phone functions as well as 2 D-pads. 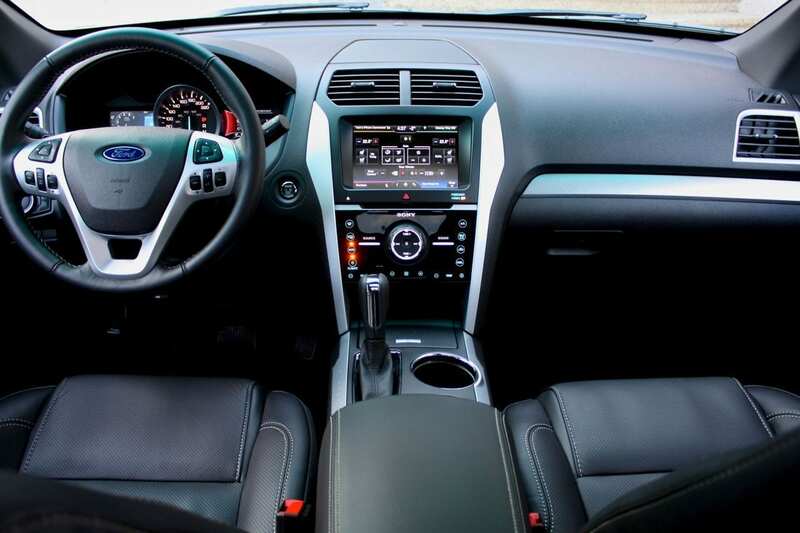 These are used to control Ford’s now-familiar information screens that flank the large center speedo – the left offers up trip meters, fuel economy and vehicle settings while the right allows you to see media, phone, navigation or climate control displays. The center stack starts with the MyFordTouch (MFT) touch-screen at the top. It manages media, navigation, phone and climate control functions – each one resides in one quadrant of the home screen. Touch any of the corners and that function will take over the whole screen, and you can drill down from there. I’ve gotten used to MFT and I can get by but it’s definitely not the most elegant system. It works once you figure out the basics, and I found the voice recognition to work well. 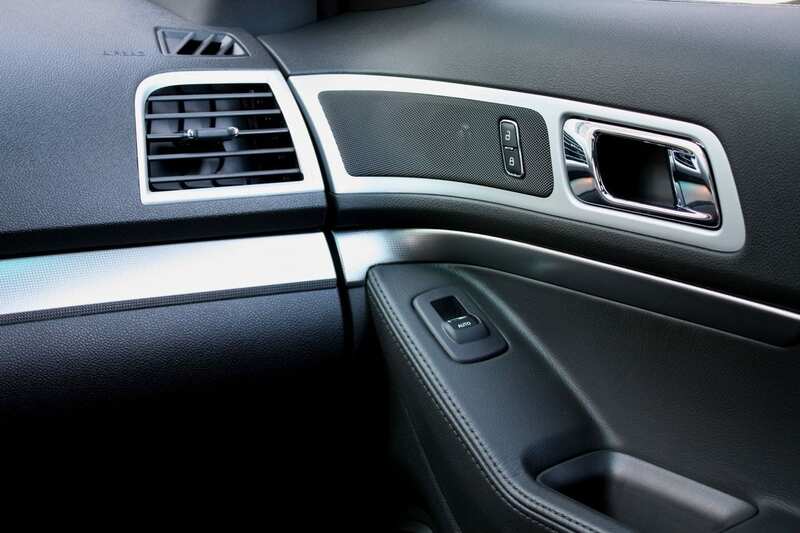 Below the screen is a soft-touch panel with buttons for the automatic dual-zone climate control system spread around the edge. In the center sits a D-pad with a rotary knob around it, controlling volume and basic tuning functions for the Sony media system, which sounds quite good. I’m not a fan of how some of the functions I want to access immediately (like heated seats) force me to look at and use the touchscreen. I’d rather they be assigned hard switches or buttons. 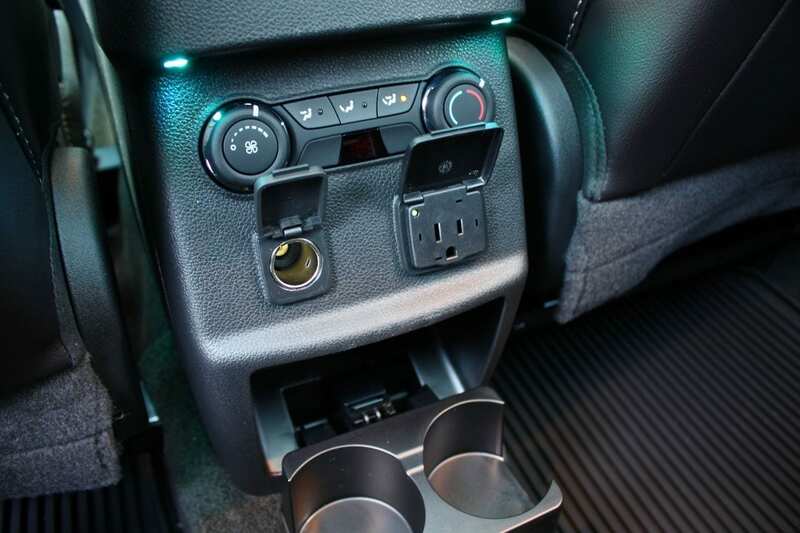 The center console has a storage bin at the front (where you’ll find one 12V and two USB plugs), the gear selector, two different-sized cupholders (which I appreciated) and the Terrain Management dial. 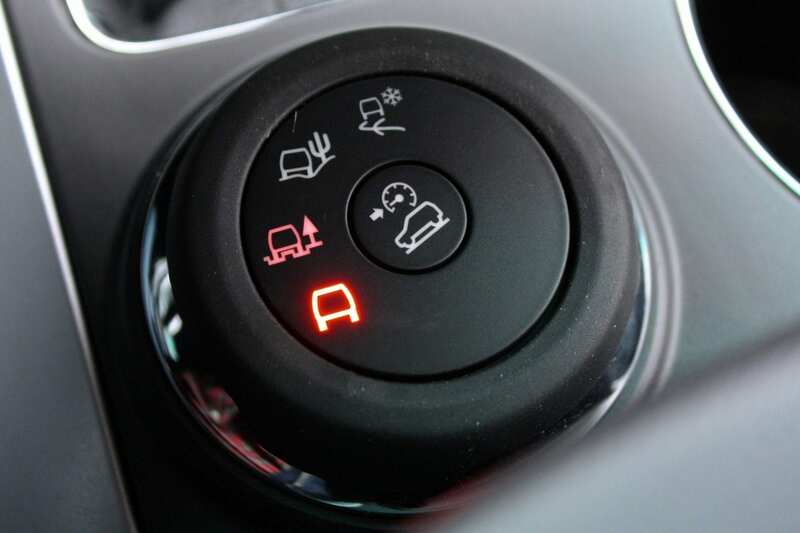 This lets the driver choose between regular, mud/rut, sand and snow/gravel/grass modes, as well as a hill descent mode – none of which will probably ever get used by 99% of Explorer drivers. Behind that is an armrest with a storage bin and another 12V plug underneath. Overhead is a dual sunroof – the front one tilts and slides, the rear remains stationary. There are 3 HomeLink garage door opener settings as well. The second row is a 60/40 split bench – three seats, three seatbelts and three headrests. The seats are comfortable, and there’s plenty of headroom for my 5’10” frame. There was enough leg room for me, but someone much taller might feel that it could be bigger. 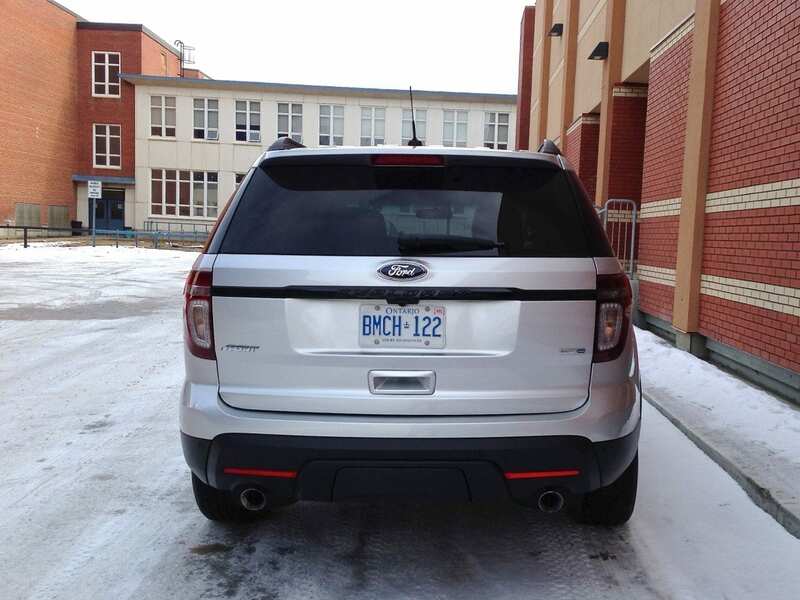 There is a rear climate zone, with a control panel at the back of the center. Ensuring devices are charged is no problem, because you also get plugs – a 12V and a 110V household one, thank you very much! 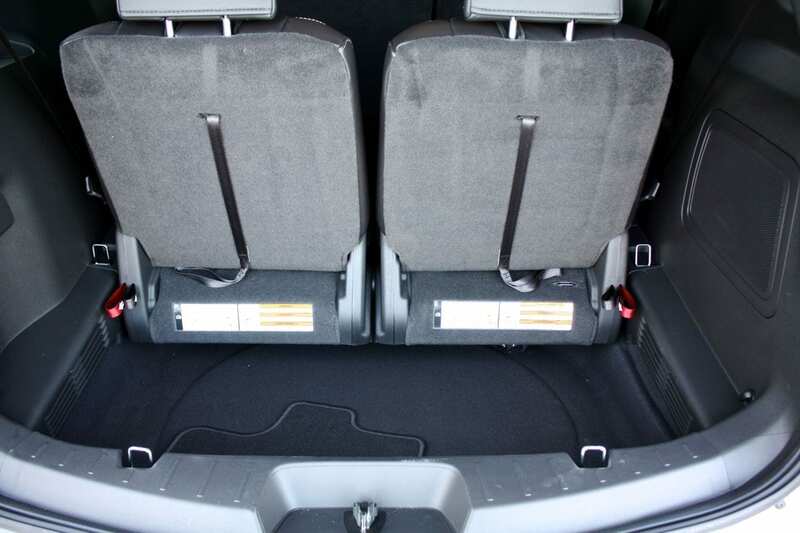 The middle seating position isn’t great – it’s narrow, hard and there’s a significant tunnel on the floor. The middle seatback folds down to become an armrest with two cupholders and there are two sets of LATCH connectors for kids’ seats. Tumbling the right side second row seat forward allows access to the third row. Here you’ll find two seats with seatbelts and headrests. I could actually sit there, though certainly not in comfort, and foot space is miserable. That said, my kids were quite happy back there. Headroom is exemplary – especially for a third row. The glove compartment has two levels, but isn’t very big and the door bins all around are usable, but not great. 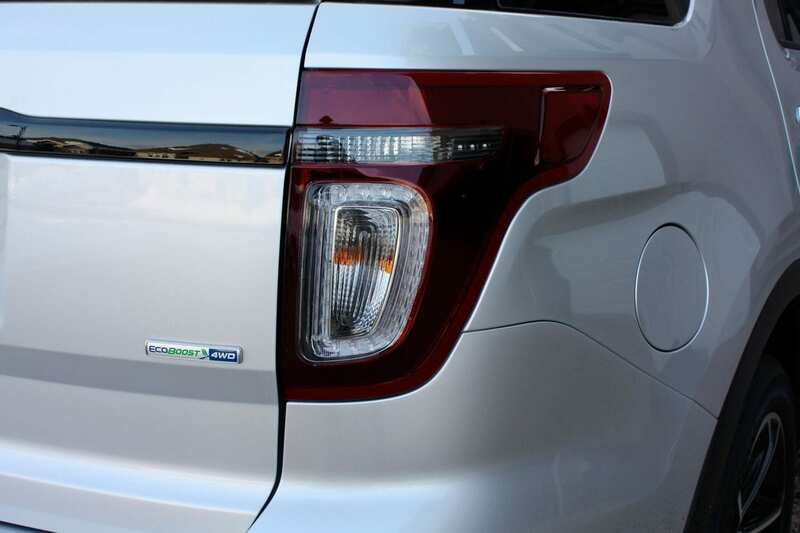 The power liftgate can be activated on the dash, inside and outside the tailgate itself and on the key fob. Speaking of the fob, it provides you with keyless entry, access to the push-start ignition and a remote starter. Nice touch. 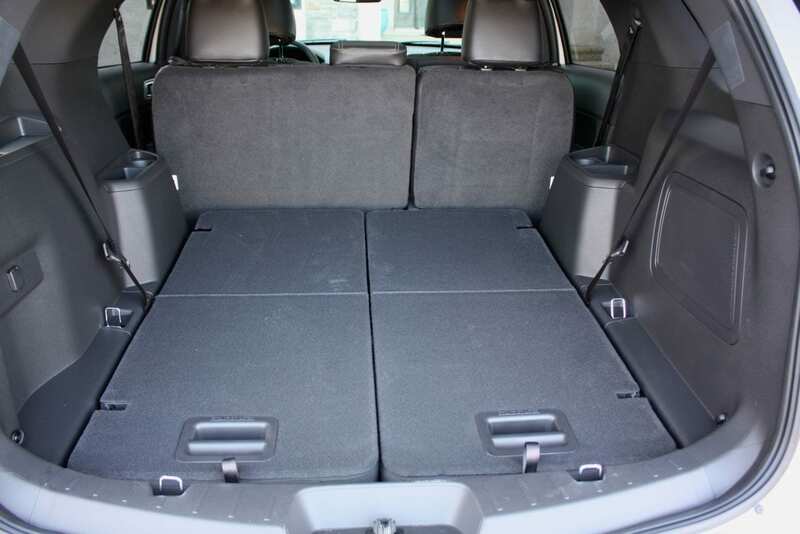 The cargo space behind the third row isn’t big (595 litres/21 cu. ft.) but there’s a deep well in the floor, so you can get quite a bit of stuff in there – there’s also a 12V plug. Fold that third row flat (the seats split 50/50) and you’ve got a very useful 1240 litre/43.8 cu. ft. space. The issue is the actual folding of the third row. 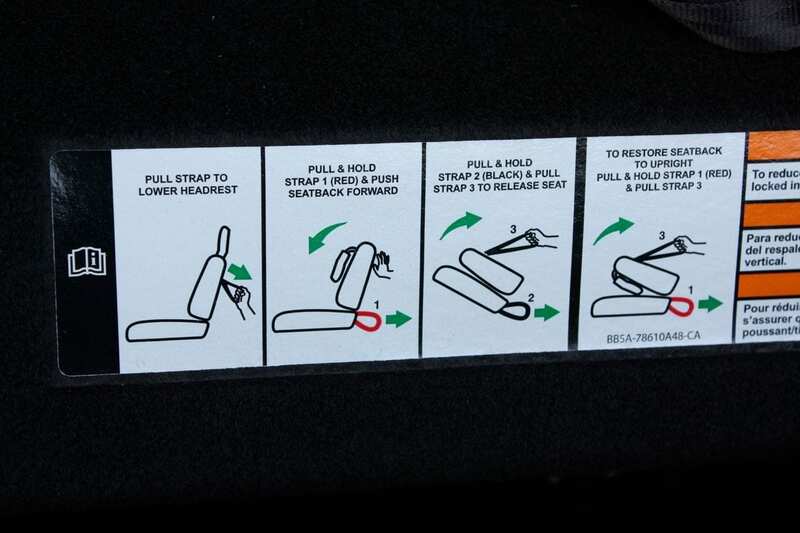 You’re faced with a confusing process, using three separate colour-coded straps. Hold this strap, pull that one. Now pull that one, and push the seat. It’s brutal. 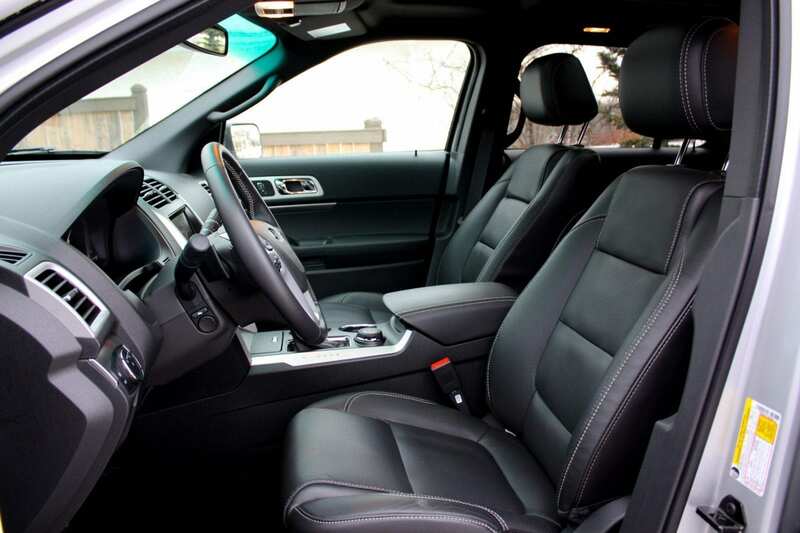 Definitely go for the power-folding seat option – it’s a winner. Especially compared to this ridiculous system. Need more room? Go ahead and fold the second row down. You’ll have a veritable cavern (2285 litres/80.7 cu. ft.) at your disposal. 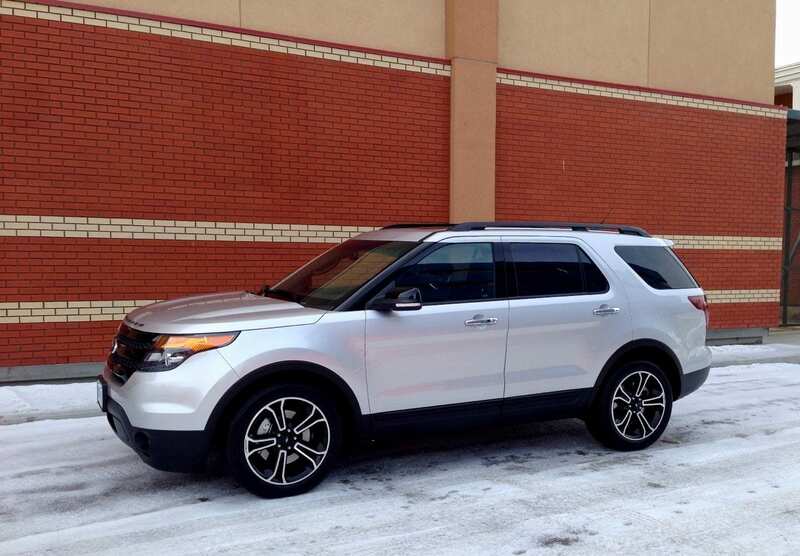 Driving the Explorer, even though this one is sold as a Sport model, isn’t sporty. Let’s just get that out of the way. This thing is big. The hood is tall, and you can’t see the road ahead of you for love or money. Visibility isn’t great, period. The rear view is skewered if you have the third row headrests up. There are enough pillars and windows on each side to make shoulder checking a drag. Thank goodness for the blind spot monitoring system. 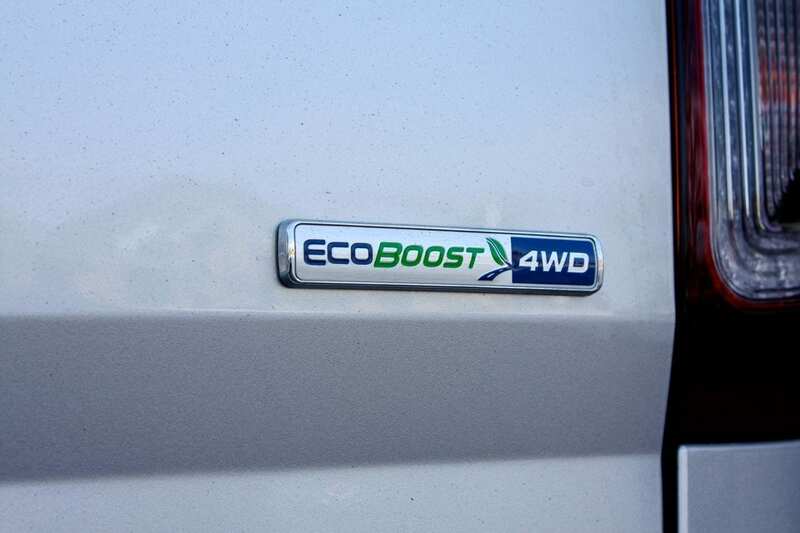 The EcoBoost engine provides solid power, and during everyday driving, it’s always there. 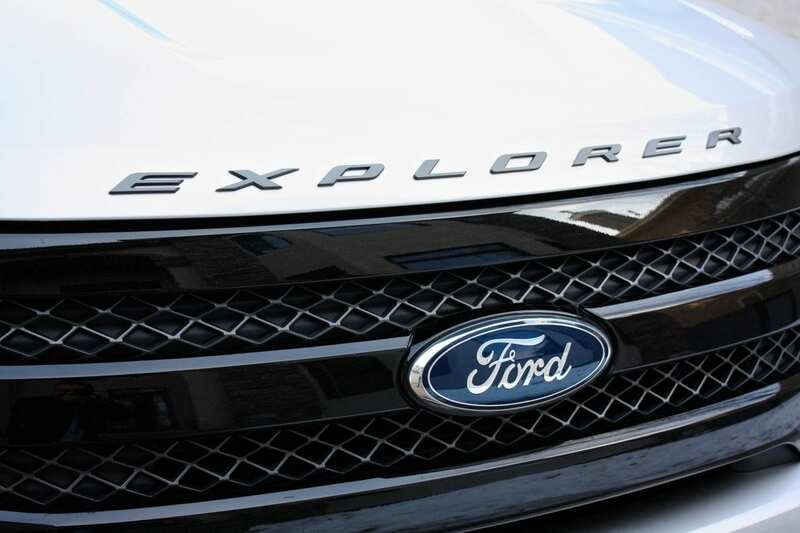 But would you pay extra for the Explorer Sport if you didn’t want to enjoy that engine above and beyond everyday driving occasionally? Well, the engine is willing and ready, but when you step on it, it feels as if the transmission gets in the way of any kind of sporty driving. 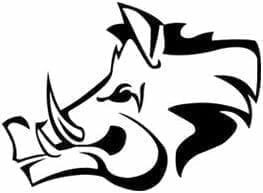 First of all, in an attempt to save fuel, it hunts for higher gears constantly. That’s fine for the majority of our driving. 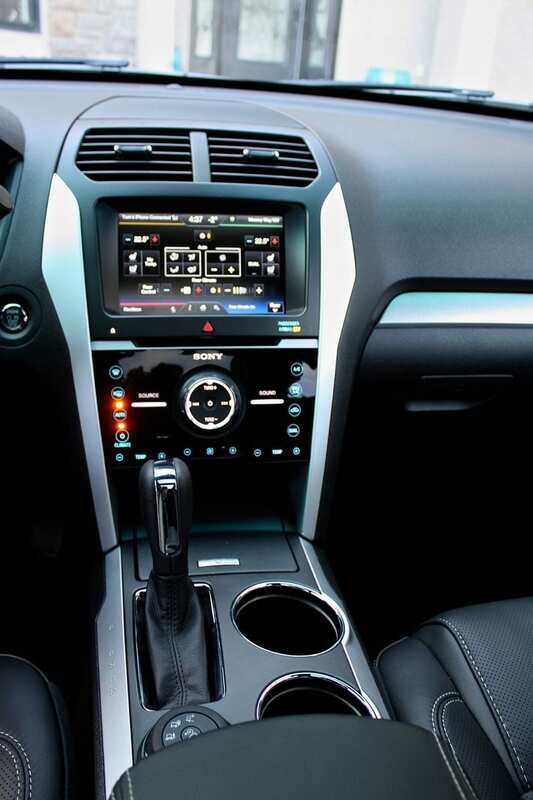 But for some strange reason, Ford doesn’t include a sport mode for the transmission. There’s no programming to tell the transmission to act more aggressively and hang on to gears longer. The only thing you can do to help is shift it manually – using paddles. First of all, the shifts are slow, almost ponderous, and secondly, paddle shifting seems very out of character for a monstrous SUV like this. I’d much rather have a sport mode that I can slap it into, and count on the transmission to do that work for me. But you can’t. And because the transmission takes its sweet time doing anything when you step on it, it never reacts the way you’d want it to. Also, I felt that the Explorer Sport felt a bit squirrely off the line. Hammer on the throttle, and it felt as though it was squirming – almost like torque steer. Maybe I’m not that far off with this, since regular driving mode biases the torque toward the front and sends it to the rear only when needed. Though the Sport is purported to have sport-tuned suspension, it doesn’t do much to change the Explorer’s road manners. I like the ride – it’s comfortable and in a straight line, it’s a very luxurious vehicle. Take any corner, at almost any speed, and you’ll immediately feel the weight and the height. There’s tons of body roll, and although grip is good, you never get the impression this vehicle is happy in any curves. The brakes are powerful, but felt a bit spongy to me. 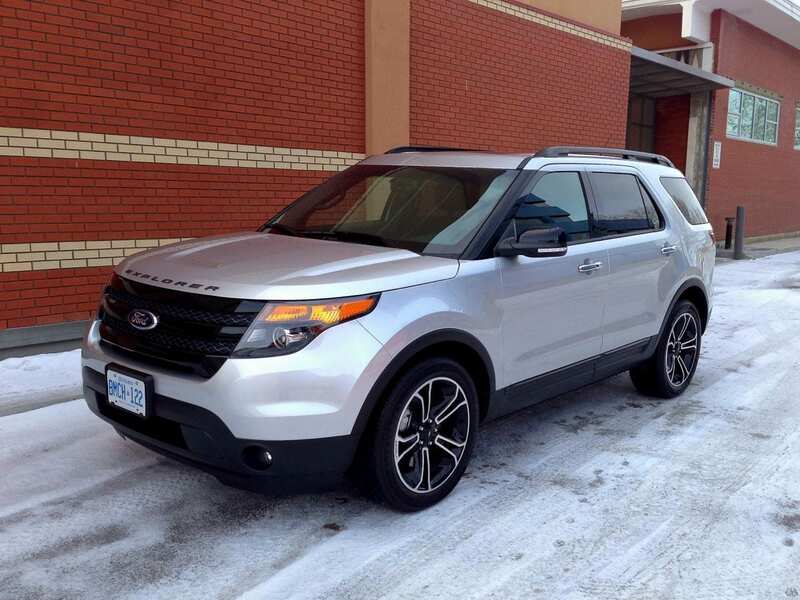 Ford rates the Explorer Sport’s fuel economy at 13.2 L/100 km in the city and 8.8 L/100 km on the highway. Most of this week was spent on city streets, commuting to and from work, dropping off and picking up kids with a couple of sprints down the freeway. And I averaged a not surprising (but still terrifying) 16.8 L/100 km. I’d hate to see what would happen if you drove this with a lead foot. So what’s the deal here? Well, I quite like the Explorer. It’s not exciting, to be sure. But when it comes in the guise of an unapologetic large, soft, cushy SUV (as it does in the other trim levels), it does most things pretty well. The fuel economy is horrible, but in line with the competition. The handling is what you’d expect. The road manners are fine and the ride is comfortable. It’s got room for 7 passengers. Everything seems to fit. WAF (Wife Acceptance Factor) was super high. She loved the way this thing drove, the way it rode, the way it moved our kids and the way she could get a day’s worth of spending my money at the mall behind the second row of seats. She did miss the Active Park Assist, and hated the way the third row folded down. But I’m not sold on this Explorer Sport. I don’t think I’d be ponying up the extra cash for this engine and the “sport-tuned” suspension considering you really can’t get to it. Sure, it looks good. Sure, it’s the fastest Explorer. Sure, it does 0-60 in a shade over 6 seconds. Sure it handles better than the normal Explorer but it’s still not sporty handling, and the transmission hampers any chance of having fun. 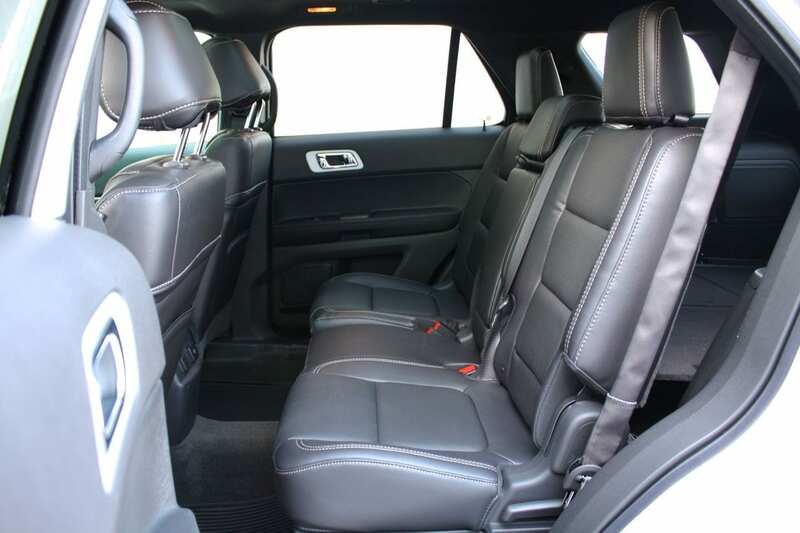 I reviewed a similarly priced Explorer Limited, which is really the same vehicle – it came with all the bells and whistles, including the Park Assist and the power folding seats that I missed on this one, and that made much more sense to me. If I wanted a loaded-up Explorer, that’s the way I’d go and I’d leave the “sport” to vehicles that can walk the walk instead of just brandishing the badge.